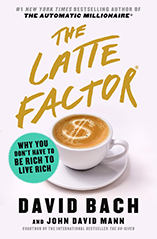 A little over a year ago I saw author David Bach on CHCH TV in Hamilton Ontario promoting his new book, “Start Late, Finish Rich”. In the short television interview I liked what he had to say so much that I went out and bought the book. I have read “Rich dad, Poor Dad”, and “The Wealthy Barber” many years ago and I found both had their own positive lessons and strengths. In Mr. Bach’s book however, I liked his approach to getting out of debt and saving much more practical and I got some ideas that I hadn’t thought of that were very easy to put into practice. My wife and I were not exactly the target audience for the book. We both have investments, not much debt and we’re under 35 but we still found some ideas in the book that we adopted quickly to make our financial picture even better. In fact we liked the book so much, we went out and bought it for two friends.